June Dudley grew up in the country near the small town of Iola, Texas, in an area known locally as the river bottom, a place where she has cherished memories of family and rural values….where the Western attitude and ranching were lived everyday. Cowboy lore was not just stories for the artist, but everyday life for her family. Her father worked cattle, and it was not unusual for Dudley and her sister to ride horses all day working as "cowhands” on the range. A love of the land comes naturally, and today she owns the ranch that has been in her family for over 100 years and is recognized by the State of Texas. Dudley cherishes the times she worked with her father on the ranch, which also gave her an appreciation of the Western way of life. Dudley began painting at the early age of around eight. With no canvases to be had at the time, the budding artist used cardboard. Her earliest inspiration came from visits with an aunt who painted. The little artist was fascinated by the brushes and paints displayed in her aunt’s home and longed for her own. When her wish was granted, it was a dream-come-true for the little girl who knew she would one day become an artist. With a combination of impressionism and realism, the artist’s favorite subjects have become landscapes. Using a colorful palette that brings the viewer into her scenes, Dudley also favors figurative pieces that often include her grandchildren, other family members, and close friends. Garden scenes are prominent in her works having observed her mother grow beautiful flowers for as long as she can remember. Dudley’s works are represented by various galleries in Texas, among them The Midland Gallery in Midland, the Fredericksburg Art Gallery in Fredericksburg, and the L Bar Gallery in Kerrville. The artist has exhibited at shows across the nation in Houston, at the Peppertree Show in California, the Mountain Oyster Show, the Best of the West in Arizona, and at the Governor’s Invitational for Cheyenne Frontier Days. Dudley’s work has been featured in various publications such as Art of the West and Country Lifestyle magazines, and several newspapers. Dudley’s image, "Boss Lady,” was the cover art for the 2007 Houston Livestock Show & Rodeo School Art Program Awards Presentation booklet. 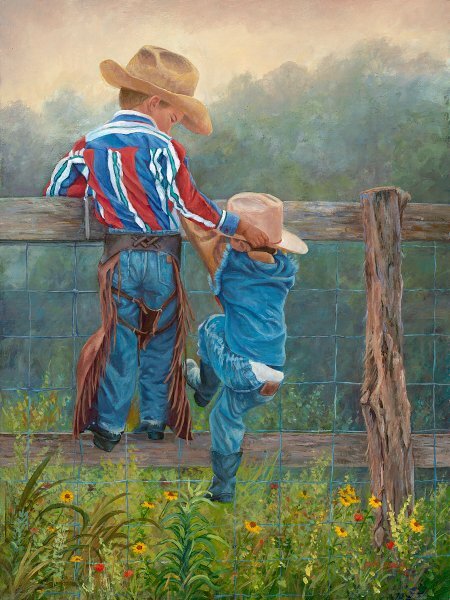 Come to the country and enjoy the people and places that are dear to this rancher’s daughter – Dudley captures her Texas family legacy with images that come from the bottom of this very talented artist’s heart.